It was good when Raj Kapoor did it in Sangam. Him being him, he had class. But when Saif Ali Khan plays the martyr in a slip-shod movie by Lawrence De'Seuza, you kinda feel sorry. For yourself. Aarzoo is the kind of film that makes you want to tear the cast's hair out, but since you can't do that, you must settle for tearing out a little of your own. Pooja (Madhuri Dixit) is the daughter of Dayashankar (Amrish Puri, that sweet old man who is forever misused by the industry, this film being no exception), a rich and successful businessman who keeps repeating that he owes his fortunes to his late friend Rajapal. In one of those Bollywood ishtyle flashbacks, you get to see that Rajpal was killed by Kailashnath, his sleazy half-brother. Dayashankar promises the dying Rajpal that he will look after his little son, Amar. Amar is sent abroad to study. Back in the future, Pooja grows up and has nothing better to do than to shop all day with her friends. Tired of that, she decides to fall in love with Vijay (Akshay Kumar), a pilot with no known family. This happens through a series of incidents that are supposed to be funny, but are juvenile and rather irritating. Amar (Saif Ali Khan) returns, and surprise, he too is in love with Pooja. But he decides to 'sacrifice' his love, in a quintessentially Bollywood gesture. Against papa Puri's better judgement but seemingly with his blessings, Pooja and Vijay get engaged. But Vijay is tragically killed in an air crash, and Pooja is forced to marry Amar so that she can give her unborn baby a name. The movie plunges into more meaninglessness as Vijay returns after a few years, alive and ready to kick some you-know-what. The movie is full of stereotypes - the story, the dialogues, the music, the performances, everything. There is not one original shot, not one original thought that has gone into the making of Aarzoo. Lawrence D'Souza, who gave Saajan, better get his act together. 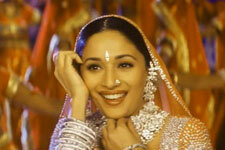 Madhuri Dixit looks ordinary, with her usual spark missing. Akshay Kumar and Saif Ali Khan need some acting lessons. There is really no reason for you to watch Aarzoo, except if you need a novel haircut. Be the first to comment on Aarzoo! Just use the simple form below. fullhyd.com has 700,000+ monthly visits. Tell Hyderabad what you feel about Aarzoo!